Have you been wondering where we’ve been lately? We have been busy harvesting a boatload of cucumbers, squash, and zucchini from our garden! Fortunately, we’ve been getting some much needed rain, and the plants have answered with a great big THANK YOU! But when all this produce comes in, you’ve got to do something with it. 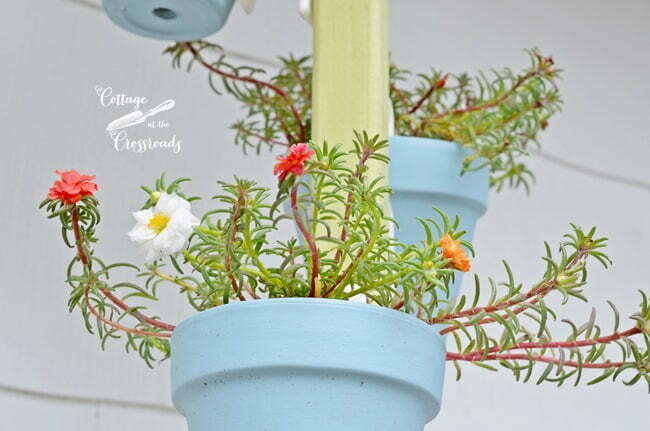 We did take a little time lately to whip out this hanging terracotta pot holder that I’m sharing with you today. 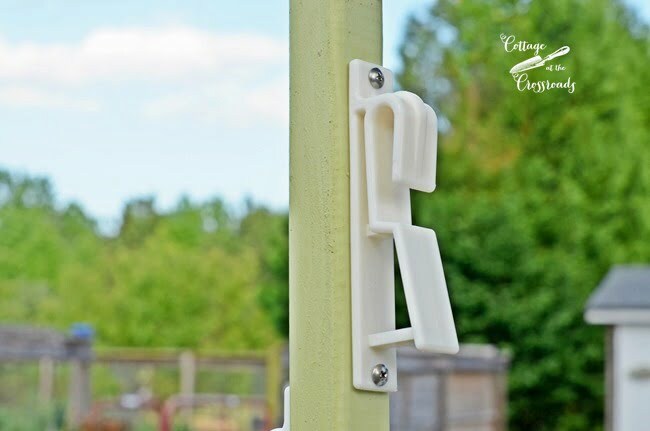 Do you know about these terracotta pot hangers? 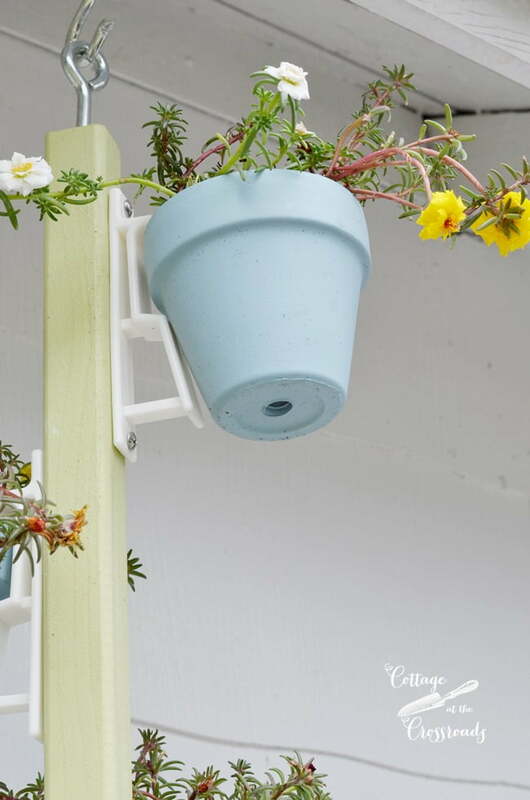 They are the niftiest things that allow you to hang a flower pot anywhere you’d like! I first purchased mine soon after we moved to the Crossroads. 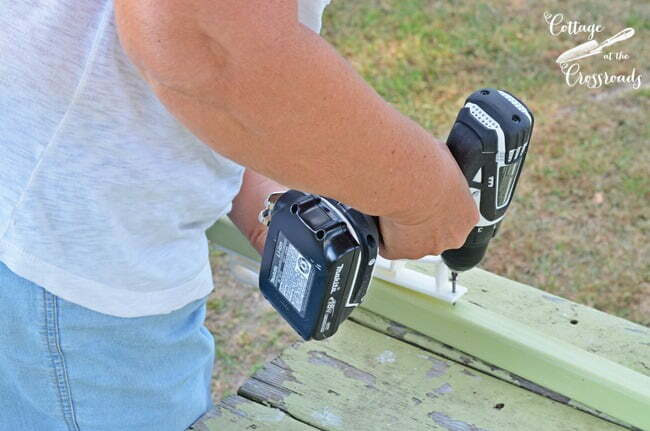 I used them to hang some pots on the pickets of the railing of our deck. 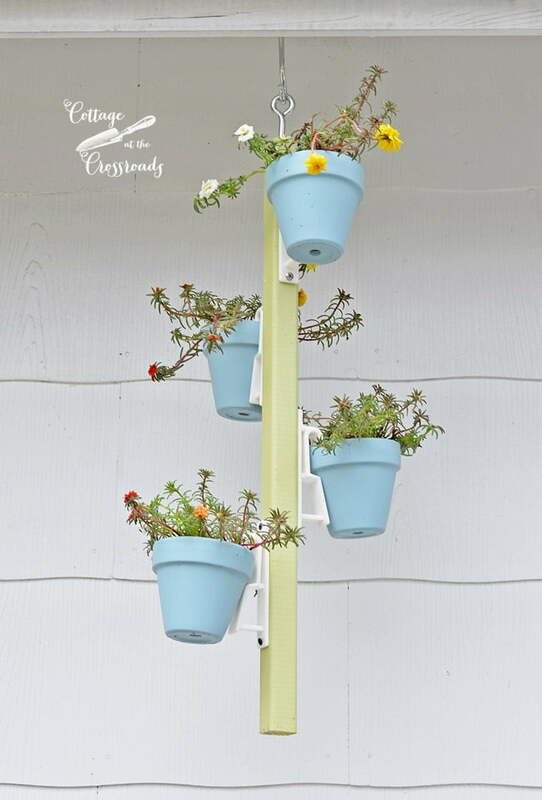 And then we used them when we made this plant stand for our back deck. I was so pleased with the pot holders that I decided to become a distributor and sell them in our SHOP on our blog. I have shipped out many of them to places all around the country, so many that I ran out of stock! But I’m happy to report that we have them back in stock in case you’ve been looking for them. 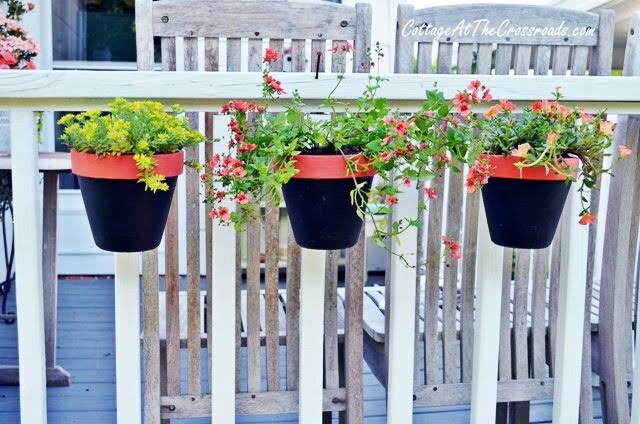 So Leo and I came up with a new way to use the pot holders by creating this hanging terracotta pot holder. 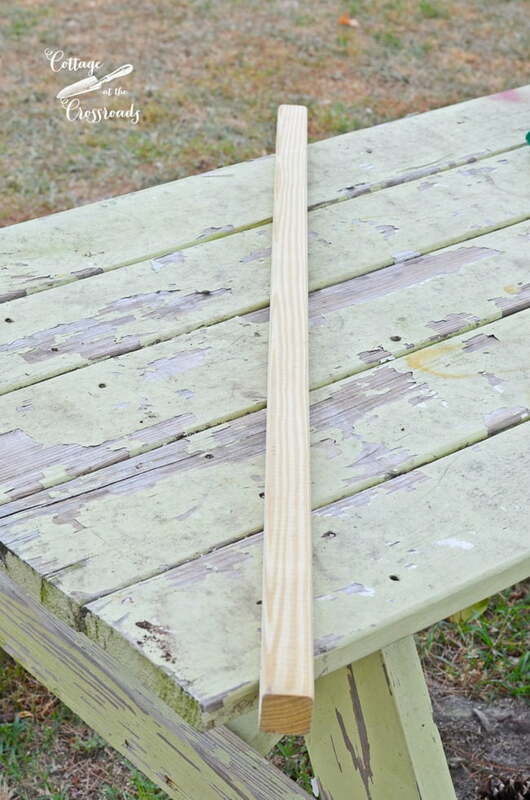 We purchased one wooden picket from Lowe’s. Leo picked up a metal screw eye and a hook while we were at Lowe’s and screwed in the eye for me. 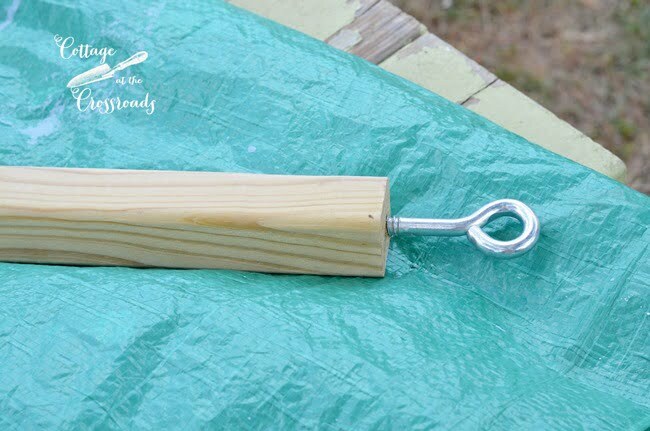 I painted the picket with the green color that we paint a lot of outdoor things around here. The color is Bella Mint by Valspar but that color is no longer available. I just take a sample of the color to Lowe’s and they custom mix it for me. 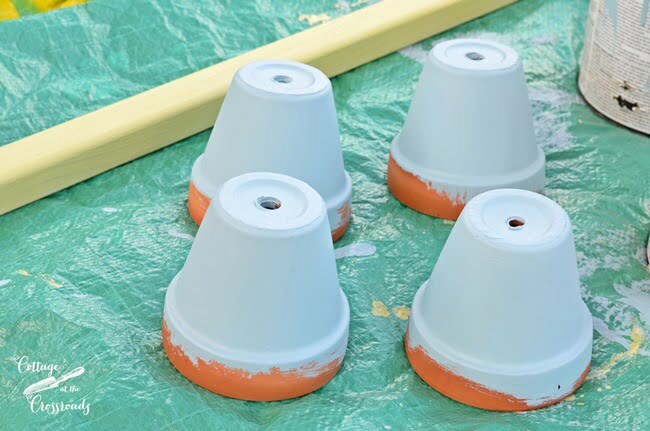 The blue that I used on the pots is actually the stain that I used to paint our picket fence panels in the garden. I have no idea how the stain will hold up but it’s such a pretty shade of blue that I just had to use it! 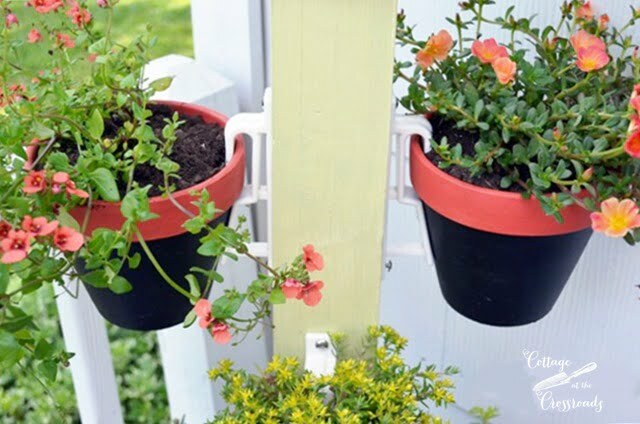 The only thing left to do was to plant some flowers in the pots and hang it up. 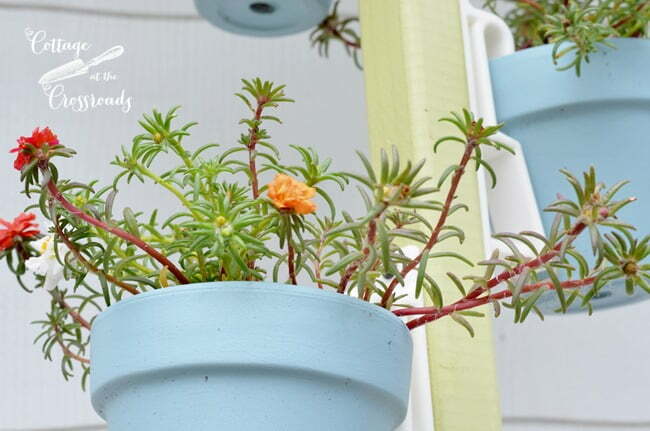 I decided to use some portulaca in the pots because they can tolerate the hot sun that we get on the deck. In this photo, you can see how the pot holders work. I used small pots, but they will support up to a 10 inch pot, but you have to make sure the pot has a rim. The portulaca that I planted is multi-colored. It makes for a pretty, summery greeting for guests that come to our back door (which is most everybody!) All of our friends are back-door friends anyway! 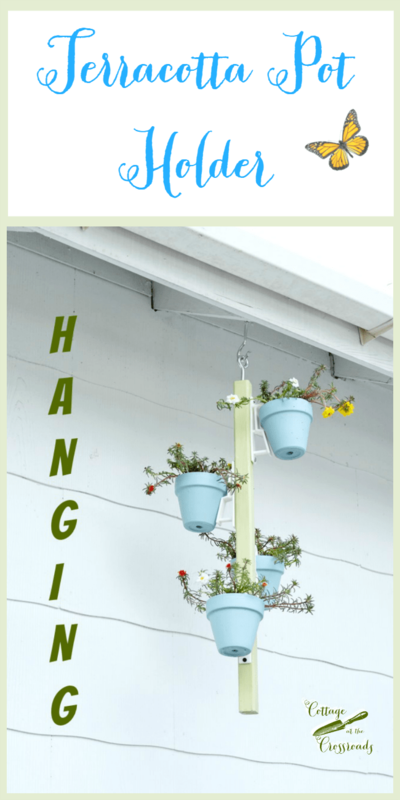 So after I made this one and hung it up, I was thinking how this could be used to plant herbs and hang them right outside your kitchen door where they would be so handy. My herb bed is out in the garden, but don’t be surprised if I make a hanging herb pot soon! In the meantime, I’ll be back soon with one of my favorite zucchini recipes since we have so much of it! Such a cute idea Jane!! Hi Jane – I have been reading your blog for about a year. I grew up in Hartsville and later moved to Florence. About eight years ago I moved to Nevada. I just recently went back home for a visit. On my way back from Florence we stopped in Oats at a crossroads. I happened to look across the street and there was this lovely home. When I saw the water feature and the birdhouses I knew who lived there – you and Leo! What a surprise as I didn”t realize you were in SC much less so close to where I once lived. If you had been outside I would have walked over to say hello. What a small world! I had commented on one of your earlier post but I guess you have been busy in the garden. I planted some tomatoes and basil today. If you ever make it to Vegas I would love to meet you and Leo. Looking forward to your next post. Take care from one southern girl to another. Debra, I think it’s amazing that you recognized the house and the waterfall just from reading the blog! I sent you an email after you left a comment on an earlier post, but it came back undeliverable. What a small world that you grew up so close by. I really wish you had walked across the street and knocked on the door because I would have loved to have met you. Leo and I have never been to Vegas but perhaps one day we’ll get there and I will certainly let you know if we do. If you are ever visiting your family in the area again, please stop by! Darling project Jane, can’t wait to see one filled with herbs. What are you doing with all your garden harvest? Maybe open a farmers market at your house. Super cute and clever Jane. Love this.